Workers at “technology laggard” businesses are much more likely to be frustrated or quit, putting procurement organizations’ talent management strategies at risk, according to a report by Unisys Corporation. Titled “The New Digital Workplace Divide,” the research illustrates how a company’s technology maturity plays a significant role in employee satisfaction — perhaps the key role. 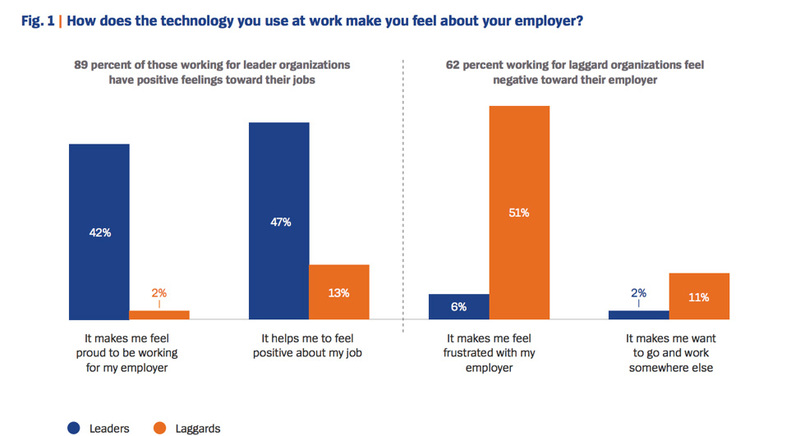 Workers at organizations whose tech lags behind the industry standard report frustration at a rate of 51%, compared with only 6% for those who work for tech leaders. Keep up to date with today’s procurement software vendors: Access SolutionMap rankings across nine technology areas. Productivity is stifled when workers are frustrated by their laggard IT systems, procurement software included. The result is that employees consider quitting, often moving to more tech-forward firms. Davis taps into a key theme of the research report in referencing employee agility. Workers at technology laggards are asking for modern procurement solutions that provide the ability coordinate work in multiple locations. This contrasts with the needs for tech leaders, who focus on security. But mobility and security are not the only topics on employees’ radars. When asked to identify which emerging technology would transform the workplace the most in the coming years, respondents gave the internet of things the top position (31%), followed by artificial intelligence in a close second (27%), along with robotic process automation (RPA) and others. While the majority of those surveyed expressed some familiarity with these emerging technologies, the uncertainty of their future effect on the workforce provides a distinction from the rest of the research results. Workers at technology leaders, for example, are 56% more likely to be worried about their jobs becoming obsolete due to advancing technologies than employees at technology laggards. For procurement organizations, retaining strong performers and attracting top candidates is crucial to achieving long-term goals. Key to ensuring this positive employee experience is selecting the best-fit procurement software provider for an organization's unique needs. This is why the Spend Matters SolutionMap process takes a persona-based approach ranking procurement solutions, helping organizations to identify their requirements, compare vendors through in-depth reviews and comparisons, and tailor their tech selections accordingly.